Although the "Intelligent Building, Building Intelligence" China Forum in Shanghai had been postponed we kept our travel plans in place and went to Shanghai. While there we met with Jackie Cheng and Scott Xu of DGI International Corporation to discuss the rescheduled event. 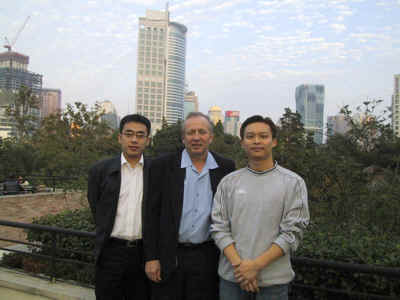 This picture is taken on the rooftop of Starbucks overlooking the Renmin Park and People's Square. We talked about why buildings need to be more intelligent and the fit of these new styles of buildings into China's sustainable future. Some of the discussion was around the labeling of energy and environmental performance of large buildings. We joked that perhaps buildings should have to display this number on the outside to increase public awareness of the impact each of these structures has on the energy and environmental infrastructure. We talked openly on many topics and I was impressed by their desire to provide a great event, informing as many as possible. We talked a lot about who would be the audience and that this first event would have to reach out to a varied group and provide some cross pollination messages on the Why and How of Intelligent Buildings. I was extremely pleased to learn of their intent to use web-based virtual presentation and attendance as an active part of the event. This will allow global input in a cost effective manner allowing more AutomatedBuilding.com readers to participate and learn from this first ever event. We will keep you posted as this event unfolds, likely early this coming spring. While in Shanghai friends from the industry Maurice and Shirley showed us their Shanghai. An exciting and vibrant city. 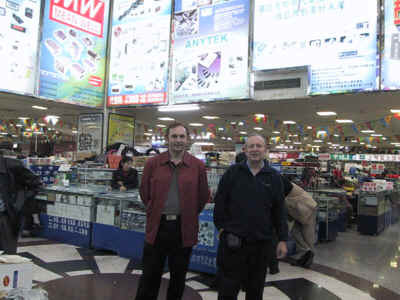 The picture at the left shows Maurice and I in an electronic supermarket; one of several large buildings selling electronic components used in the building of many products including controls. The scale of everything in Shanghai is immense and sometimes overwhelming. Manufacturing is very much a part of the local industry and is reflected everywhere. Maurice was able to arrange a tour of a local large building automation system that had just been completed. The control contractor we visited in Shanghai was called 'Basic', an Automated Logic Corporation dealer: Shanghai BaiCheng Automation Corp.
Shirley came along as our interpreter which was mandatory as all building operators and control contactor employees spoke only Chinese and the rest of us only spoke English. The web based ALC screen looked very familiar but the Chinese characters on the graphics and in the text language made you aware that this was not a typical North American project. Communication was somewhat limited but I could see that fire and security had very separate systems and had not reached the level of evolution that the building management system had and little had been done to integrate at all on the web level. 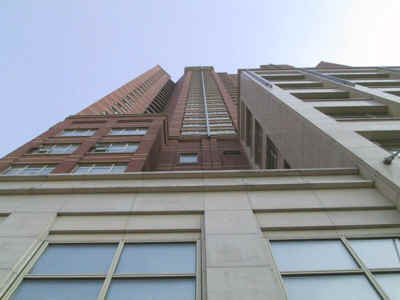 An attractive building which had just been completed. 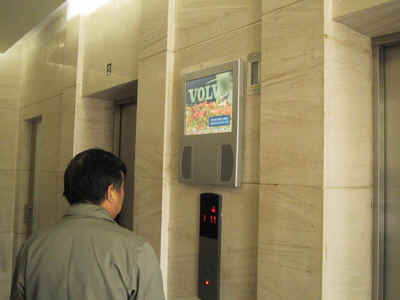 I was impressed with the use of digital signage; a welcome addition to improving building intelligence. The project manager was very proud of the project which was very professionally installed.